Summary: Degeneration of the basal forebrainappears before cognitive and behavioral symptoms of Alzheimer’s occur, a new study reports. Alzheimer’s disease is a neurodegenerative disorder for which, despite years of research, there are no effective treatments or cures. 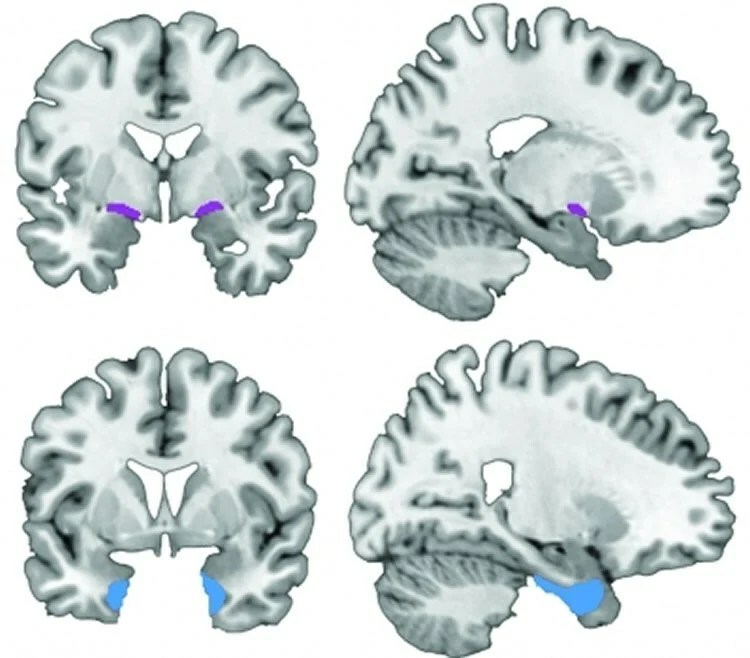 Front and side views of two regions of interest for the origins of Alzheimer’s disease – the basal forebrain, top, and the entorhinal cortex, bottom. NeuroscienceNews.com image is adapted from the Cornell press release. Funding: This work was funded by grants from the National Institutes of Health and the Alzheimer’s Association. Image Source: NeuroscienceNews.com image is adapted from the Cornell press release. Cornell. “Study Challenges Model of Alzheimer’s Progression.” NeuroscienceNews. NeuroscienceNews, 4 November 2016. Cornell. “Study Challenges Model of Alzheimer’s Progression.” http://neurosciencenews.com/alzheimers-model-challenge-5431/ (accessed November 4, 2016). There is considerable debate whether Alzheimer’s disease (AD) originates in basal forebrain or entorhinal cortex. Here we examined whether longitudinal decreases in basal forebrain and entorhinal cortex grey matter volume were interdependent and sequential. In a large cohort of age-matched older adults ranging from cognitively normal to AD, we demonstrate that basal forebrain volume predicts longitudinal entorhinal degeneration. Models of parallel degeneration or entorhinal origin received negligible support. We then integrated volumetric measures with an amyloid biomarker sensitive to pre-symptomatic AD pathology. Comparison between cognitively matched normal adult subgroups, delineated according to the amyloid biomarker, revealed abnormal degeneration in basal forebrain, but not entorhinal cortex. Abnormal degeneration in both basal forebrain and entorhinal cortex was only observed among prodromal (mildly amnestic) individuals. We provide evidence that basal forebrain pathology precedes and predicts both entorhinal pathology and memory impairment, challenging the widely held belief that AD has a cortical origin.